As the rain fell, water levels kept rising, making it difficult for emergency crews to reach people who managed to escape their homes only to become stranded. NBC's Kerry Sanders reports. Authorities conducted 25 rescues and evacuated 100 people from their homes overnight Thursday as more heavy rain fell on the saturated ground of Missouri, where the governor called out the National Guard to deal with deadly floods. In the small city of Hollister, near the tourist destination of Branson and the Arkansas state line, the creek that runs through the center of town quickly rose 15 feet. No one was injured. Farther north in Waynesville, 4-year-old Elyjah Lee was killed and his mother, Jessica D. Lee, was missing after their car was swept into a creek on Tuesday, the state highway patrol said. According to The Associated Press, Lee made a distress call from her cell phone, and hours later her son’s body was found. A second woman was killed when her car was swept away by an overflowing creek outside of Jane, in the southwestern region of Missouri, said the state Department of Public Safety’s director of communications, Mike O'Connell. The Russell family declined evacuation orders as Little Piney Creek overtopped its banks in Newburg, Mo., on Wednesday. Heavy rain on Monday, Tuesday and Wednesday caused a rapid rise in the Gasconade River and forced authorities to close part of Interstate 44, which slices across the Show-Me state from St. Louis to Oklahoma. 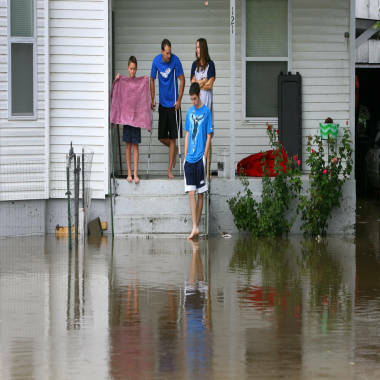 Thunderstorms swept across the southern half of the state again early Thursday, and in central Missouri the Gasconade was expected to rise to 32 feet — 12 feet above flood stage. The National Weather Service predicted another round of thunderstorms in the area for Thursday night into Friday morning and againFriday night into Saturday morning. As a result, southern and central Missouri and southeast Kansas are under a flash flood watch through Saturday. Gov. Jay Nixon on Wednesday declared a state of emergency and ordered 50 military police from the Missouri National Guard to help local authorities protect lives and property. 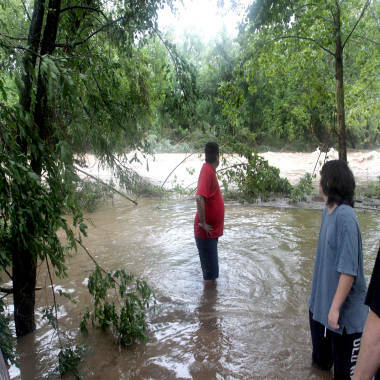 Nick Ramirez looks downstream for signs of his trailer which was swept away by flood waters. Ramirez returned to the Hidden Valley Mobile Home Park after rescuing his neighbors to find it was ripped from its spot in the park. In Nashville, Tenn., 211 water rescues were reported, Nashville Mayor Karl Dean said in a press conference. Only one person was injured, suffering a lacerated foot, officials told NBC News. The water had mostly receded by Thursday afternoon, but authorities said they would remain on alert through the evening as additional rainfall was anticipated in Tennessee for Thursday night, said Dean. “A couple more inches, and this area is going to be in trouble again so hopefully it’ll slow down,” Nashville Fire Dept. Chief George Hickey told NBC News. A massive flash flood in Missouri's Turkey Creek moved a mobile home the length of a football field, leaving one woman hanging onto a nearby basketball hoop for two hours until being rescued by the fire department. Nashville could get another four to five inches of rain, and drier air won't come into the region until sometime next week. Weather Channel meteorologist Mike Seidel reports. NBC News' Matthew DeLuca and Elisha Fieldstadt contributed to this report.